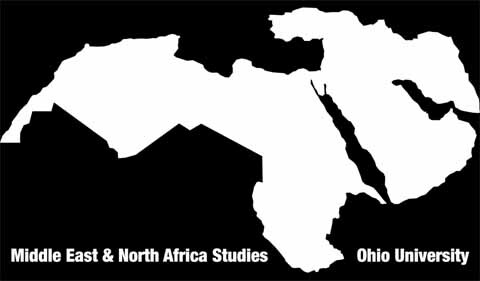 The Middle East & North Africa Studies program provides the Ohio University and Athens communities with an interdisciplinary understanding of the history and contemporary dynamics of the Middle East and North Africa (MENA) region. While the bulk of its efforts are focused on the undergraduate certificate in Middle East and North Africa studies, the program also organizes a range of events designed to compliment in-class education and speak to contemporary debates about the region. An exhibition featuring the sounds of daily life in Syria, including those of battles and explosions that Syrians have become accustomed to. These sound recordings and their accompanying photographs were captured in Damascus, Syria between September 2014 and May 2018. This exhibition is created and curated by Basil Masri Zada as part of his doctoral dissertation project in the School for Interdisciplinary Arts. This event is co-sponsored by the College of Fine Arts and War & Peace Theme, in partnership with Arts for Ohio, Middle East and North Africa Studies Certificate, Kennedy Museum of Art, Ohio University Art Galleries, and Create Space. Basil Masri Zada is a Ph.D. student in the School for Interdisciplinary Art at Ohio University. He will discuss his curatorial approach to Sounds of War, which is showing Jan. 22 through Feb. 2 at Trisolini Gallery. This event is co-sponsored by the College of Fine Arts and War & Peace Theme, in partnership with Arts for Ohio, Middle East and North Africa Studies Certificate, Kennedy Museum of Art, Ohio University Art Galleries, and Create Space. This documentary tells the story of Kholoud al-Faqih, the first female Sharia (Islamic law) judge in Palestine. A faculty panel will follow the screening. This event is co-sponsored by Classics and World Religion, Islamic Studies Certificate Program, Women’s, Gender, and Sexuality Studies, History, the Middle East and North Africa Studies Certificate, and the Center for Law, Justice, & Culture. An exhibition featuring the work of a group of Syrian artists who lived through part of the Syrian crisis and currently reside outside of Syria in different countries. This exhibition is created and curated by Basil Masri Zada as part of his doctoral dissertation project in the School or Interdisciplinary Arts. This exhibit is sponsored by the Kennedy Museum of Art in partnership with Middle East and North Africa Studies Certificate, War & Peace Theme, and College for Fine Arts. In this presentation, Basil Masri Zada will will give a general overview of international political attitudes toward displaced Syrian artists. He examines the the effects of the crisis in Syria and restrictions on movements (such as the travel ban) to explore how artists have changed their artistic production to accommodate these challenges. Basil Masri Zada is a PhD student in the School for Interdisciplinary Arts at Ohio University. This event is sponsored by the Kennedy Museum of Art in partnership with Middle East and North Africa Studies Certificate, War & Peace Theme, and College for Fine Arts. Dr. Özgür Özdamar is Associate Professor of Political Science at Bilkent University and currently a visiting fellow at Johns Hopkins University. His research focuses on foreign policy analysis, forecasting, international relations theories and security studies. He currently serves as vice president and program chair at the International Studies Association-ENMISA section, as editor of All Azimuth: Journal of Foreign Policy and Peace and director of research at Center for Foreign Policy and Peace Studies. This event is sponsored by the War and Peace Theme in partnership with Middle East and North Africa Studies Certificate. Dr. Loren Lybarger, Associate Professor of Classics and World Religion and Director of Islamic Studies, will survey the different types of religious movements and politics that manifested during and after the Arab uprisings (the “Arab Spring” events). He will also examine the role of state violence (both US and local regime) in creating the conditions for the emergence of these movements. Furthermore, he will describe the debates that have arisen among Muslims globally in response, especially, to radical Salafism and the Islamic State. This event is sponsored by the Kennedy Museum of Art in partnership with Middle East and North Africa Studies Certificate and Islamic Studies Certificate. Dr. Ilana Feldman, Professor of Anthropology, History, and International Affairs at George Washington University, will give the keynote lecture at the 2019 Ohio University History Graduate Conference. She is the author of Governing Gaza: Bureaucracy, Authority, and the Work of Rule, 1917-67 (Duke University Press, 2008), , Police Encounters: Security and Surveillance in Gaza under Egyptian Rule (Stanford University Press, 2105), and Life Lived in Relief: Humanitarian Predicaments and Palestinian Refugee Politics (University of California Press, 2018), among several other works. This event is co-sponsored by the History Graduate Student Association (HGSA), History Department, Contemporary History Institute, Center for International Studies, War & Peace Theme, and Middle East and North Africa Studies Certificate.